Fishing Participation up 1.5 Million According to 2017 Special Report on Fishing. Report also reveals participation trends and motivating factor. 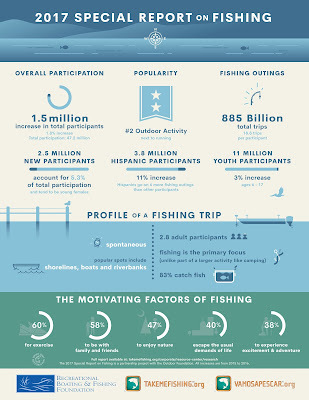 We received this brand new data from the he Recreational Boating & Fishing Foundation (RBFF) today and thought it was exciting enough to share. Earlier today, the RBFF announced the release of its 2017 Special Report on Fishing. Most significantly, the report shows fishing participation has increased by 1.5 million over the previous year. Additionally, several exciting trends and participation increases among key segments are highlighted in the report. "These findings energize us and provide some validation for the work we are doing on a daily basis," said RBFF President and CEO Frank Peterson. "Our efforts to recruit new audiences and bring families to the water are certainly paying off. 60 in 60 is off to a great start, and effective R3 (recruitment, retention and reactivation) programs will only grow the participant base and secure funding for conservation programs for years to come." The Special Report on Fishing is the product of a partnership between RBFF and the Outdoor Foundation and looks into participation trends, barriers to entry, motivating factors and preferences of key groups of anglers. "Research shows that fishing is an essential piece of America's outdoor tradition, and it often leads children to pursue outdoor activities and healthy living into adulthood," said Ivan Levin, deputy director of the Outdoor Foundation. 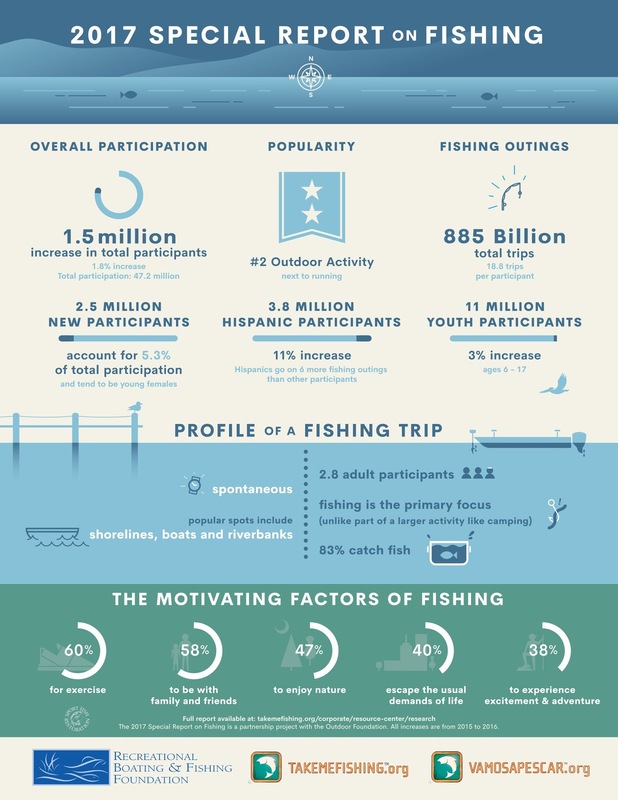 "This report aims to help the fishing industry, and the entire outdoor industry, understand fishing participation in order to engage even more people in recreational fishing and create the next generation of lifelong anglers and outdoor enthusiasts." RBFF is a nonprofit organization whose mission is to increase participation in recreational angling and boating, thereby protecting and restoring the nation's aquatic resources. RBFF's recently announced 60-in-60 effort strives to attract 60 million anglers to the sport by the end of 2021. To help recruit, retain and reactivate participants, RBFF developed the award-winning Take Me Fishing™ and Vamos A Pescar™ campaigns creating awareness about boating, fishing and conservation, and educating people about the benefits of participation. 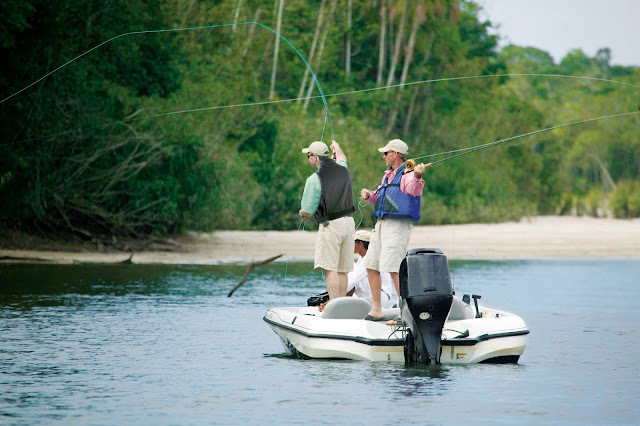 These campaigns help boaters and anglers of all ages and experience levels learn, plan and equip for a day on the water. The campaign websites, TakeMeFishing.org, and VamosAPescar.org, feature how-to videos, information on how to get a fishing license and boat registration, and an interactive state-by-state map that allows visitors to find local boating and fishing spots. The Outdoor Foundation is a not-for-profit organization dedicated to inspiring and growing future generations of outdoor enthusiasts. Through groundbreaking research, action-oriented outreach and education programs, the Foundation works with partners to mobilize a major cultural shift that leads all Americans to the great outdoors. In 2010, the Foundation launched Outdoor Nation, a pioneering initiative that aims to empower young leaders to champion the outdoors on campuses and in communities across the United States. For more information visit: OutdoorFoundation.org and OutdoorNation.org. 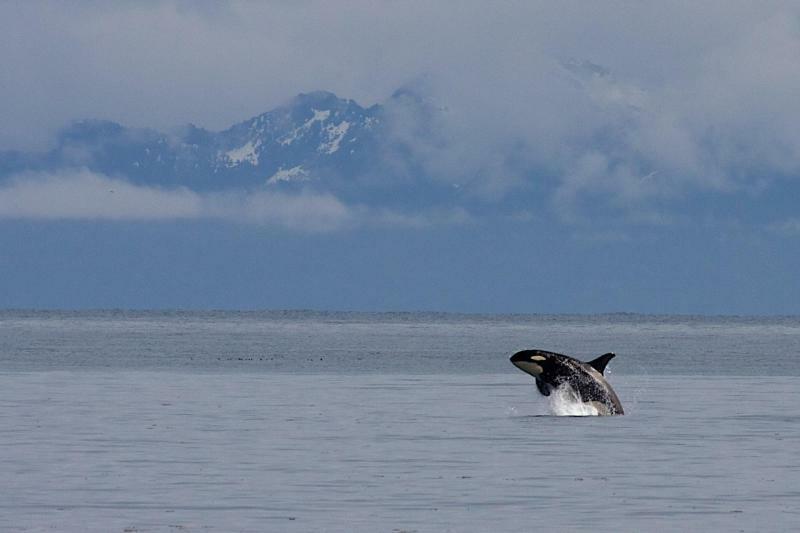 According to several news reports, a man from Sitka, Alaska, claims his 33' aluminum boat was attacked by an orca last weekend.